Petersburg is well known for its close relationship to the sea. Tlingit people settled in the area because of the rich bounty of the marine waters. In the late nineteenth century, Norwegian immigrants were attracted to the region for the same reason, and the community’s annual “Little Norway” festival celebrates this Norwegian heritage each April. A Norwegian named Peter Buschmann built Petersburg’s first fish cannery around 1900, and a thriving fishing fleet still calls Petersburg home to this day. The waters around Petersburg hold more than just fish, however. 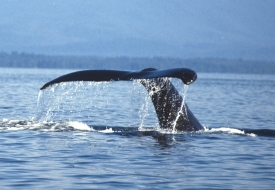 Some of the best whale watching in Southeast Alaska can be found in the nutrient-rich waters of nearby Frederick Sound and Stephens Passage. Whale watching tours are available throughout the summer, along with tours to Leconte Bay, a major harbor seal pupping area with dramatic views of the Leconte Glacier, the southernmost active tidewater glacier in North America. There are also excellent wildlife viewing sites in Petersburg and on Mitkof Island, where bears, moose, Sitka black-tailed deer, porcupines, bald eagles and other animals can be seen. We've included some of these sites to help get you started, and you're bound to discover more. For information on tours and lodging, consult the Petersburg Convention and Visitors Bureau. Visit http://www.petersburg.org or call 907-772-4636. In Petersburg, stop by the visitor center on First and Fram Street.